Ralf Bohle GmbH is increasing its lead in the European tyre market in both sales and product development. This year the company is introducing new versions of its top models such as the Marathon and the Big Apple. These and other high-end tyres in the Schwalbe range made a major contribution to the 22% increase in sales at the firm in 2007. Bohle has greatly improved one of its best sellers: the Marathon Racer. This tyre, targeted at touring, city and fitness cyclists who want more speed, is now even lighter and faster. The "fastest Marathon ever" now hits the scales at just 360 grams. Its new skin sidewall makes this possible – originating from the sport tyre series it is more flexible and lighter than a ‘normal’ rubber sidewall. Likewise the Raceguard’s origins lie in sport tyres. The protection belt made of India rubber and nylon fabric protects effectively against penetration punctures and only has a minimal effect on weight and rolling resistance. The Schwalbe Marathon Racer is retail priced by Bohle at € 32.90 in folding and € 24.90 in a wired-on version. Bohle is also extending its Big Apple series into new intermediate sizes. 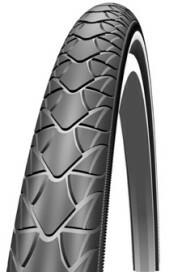 The Schwalbe Big Apple balloon tire is now also available in 55-559 ‘intermediate size’. "This size is clearly more suitable for bicycle manufacturers to design their frames around than the 60 millimeter wide tire. While at the same time the Big Apple 55mm still has the looks of a typical balloon tire", says Schwalbe product manager Carsten Zahn. Since Schwalbe introduced the extraordinarily wide Big Apple city tire to the market five years ago, creating the new category of Balloonbikes, ever more City-bikes have been equipped with these comfortable tires. Because of its enormous volume the tire simply irons out uneven roads. Also new for this year at Bohle is a light weight tube for wide Freeride tyres. It covers the same size range as the Downhill tube: from 2.10 to 3.00 inch. The 185 gram tube, with the same proven quality as all Schwalbe extra-light tubes, is available with either Presta or Auto valves and is priced by Bohle at € 8.50 at bike shops. Schwalbe’s attractive new entry-level model, the Lugano, features a trendy two-colored compound that suits almost any racing cycle color scheme. The tyres combine black with blue, red or yellow, and are also available in black alone and a black with beige skinwall version. The classic diamond profile provides reliable performance on dry and wet roads. The Lugano also features a puncture protection belt. Caption: New Marathon Racer. This tyre, targeted at touring, city and fitness cyclists who want more speed, is now even lighter and faster.